In other words, when you have finally saved an $80,000 deposit to buy a $400,000 house by selling your time for 38 hours per week, guess what happens? The bank is allowed to create the $320,000 on the spot, which you then have to pay back, plus interest for the next 30 years. I am writing this open letter as I have some questions regarding the data in Statistics Table D3 at www.rba.gov.au and would appreciate any help in answering them (using broad money definition). In January 1990 there was a total of 310.2 Billion $AUD circulating through the Australian economy. By January 1991 an extra 12.3 Billion had been created, bringing the total amount of Australian dollars circulating through the Australian economy to 322.5 Billion. During those twelve months the Reserve Bank only created an extra 1.4 Billion in notes and coins. Who created the remaining 10.9 Billion? How did they create that 10.9 Billion? Can that extra 10.9 Billion be destroyed? If so, how? (not referring to actually burning $100 bills obviously). Does anyone actively restrict (through regulation) how much extra money they create each year? Thank you for your letter dated 30 April 2012. It is common for broad money to grow faster, in dollar terms, than currency. The difference is mainly driven by a process called ‘money multiplication’, described in most macroeconomic textbooks (1). To use an example, if you invest $100 of newly minted cash in a bank deposit, your new deposit balance counts as money. If the bank then lends the $100 to, say, a business, most of these funds will return to the banking system as deposits. Consequently, the increase in broad money in dollar terms can be considerably larger than the increase in currency. The bank, the person and the business have interacted to create the additional money. The process can be reversed. For example, if the household sector chooses to increase its holdings of notes and coins relative to its bank deposits, there is a decrease in the liabilities of the banking system and consequently the assets that it can fund. The creation of money is not directly regulated, though the Reserve Bank of Australia does influence it heavily through changes in the cash rate which, in turn, influences bank lending rates and the appetite for borrowing and the provision of deposits. See, for example, Mishkin FS (2009), ‘The Economics of Money, Banking, and Financial Markets’, Pearson Education, pp 345-373. Thank you for your letter dated 4 June 2012. I take it from your reply, that the extra $10.9 Billion created by the banks during 1990 was due to ‘money multiplication’ or ‘fractional reserve banking’ (1). I understand from your reply and the textbook you refer to, that while most Australians have to sell their time to obtain money, our banks are permitted to effectively print billions per year for their own benefit and that they created nearly all the money that circulates through our economy as debt. 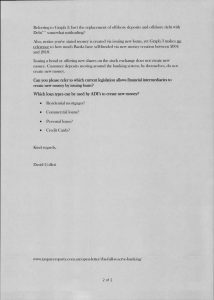 The purpose of this open letter is to argue that the current fractional reserve banking system that allows banks to create their own money, which enters our economy as interest bearing debt, is not in the best interest of Australians. 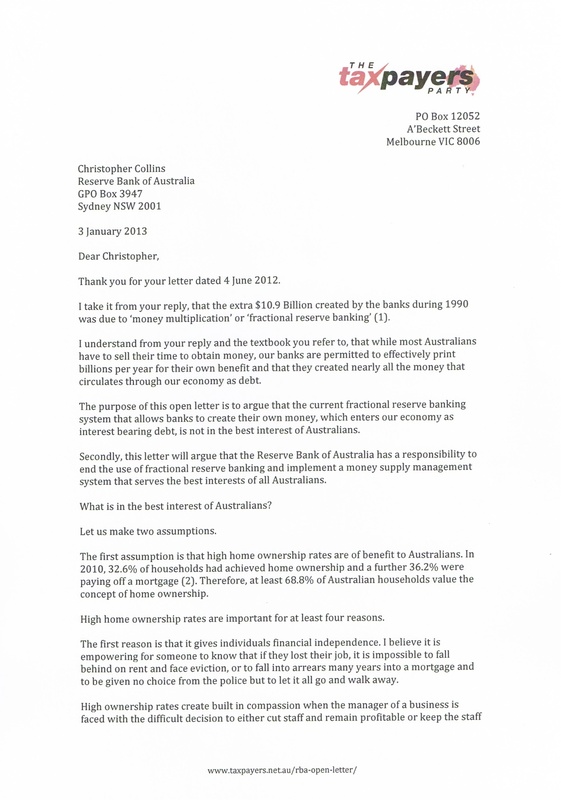 Secondly, this letter will argue that the Reserve Bank of Australia has a responsibility to end the use of fractional reserve banking and implement a money supply management system that serves the best interests of all Australians. What is in the best interest of Australians? Let us make two assumptions. The first assumption is that high home ownership rates are of benefit to Australians. In 2010, 32.6% of households had achieved home ownership and a further 36.2% were paying off a home loan (2). Therefore, at least 68.8% of Australian households value the concept of home ownership. High home ownership rates are important for at least four reasons. The first reason is that it gives individuals financial independence. I believe it is empowering for someone to know that if they lost their job, it is impossible to fall behind on rent and face eviction, or to fall into arrears many years into a mortgage and to be given no choice from the police but to let it all go and walk away. High ownership rates create built in compassion when the manager of a business is faced with the difficult decision to either cut staff and remain profitable or keep the staff and allow the business to run out of money and therefore become insolvent. High home ownership rates would reduce the pressure on our welfare system, which takes up a good amount of the taxes collected each year by the ATO. If we had a high rate of home ownership, say 70% instead of the current 32.6%, more people could afford to pursue their own ideas. More of us could do 4 days instead of 5 and use that extra day to pursue our own interests, whether that be a creative new business idea, a more engaging job, further study or just taking the dog for a very long walk. The second assumption is that it is in the best interests of Australians if GDP* does not reduce. As a reduction in GDP* is associated with an increase in unemployment via Okun’s rule of thumb, let us assume that at least maintaining or increasing GDP is better for Australians than a falling level of GDP and therefore rising levels of unemployment. Given our two assumptions above, that high rates of home ownership and at least a stable or increasing level of GDP* is in the best interests of Australians, let us consider a hypothetical scenario. Let us imagine that every state and federal minister was committed to the Australian goal of home ownership. If our ministers were committed to the goal of home ownership, they would start initiating actions designed to remove the many economic forces that have been artificially inflating house prices faster than wages for the past 25+ years (3). The Australian Government would remove negative gearing, which permits over a million investors the ability to claim their investment property losses against their personal wage (4). By increasing the demand for residential properties, negative gearing therefore increases house prices. The Australian Government would phase out stamp duty on residential house transactions. Stamp duty directly adds to the price of houses. The Australian Government would phase out the first home owners grant (FHOG) because it increases demand for houses and therefore helps to increase house prices (5). 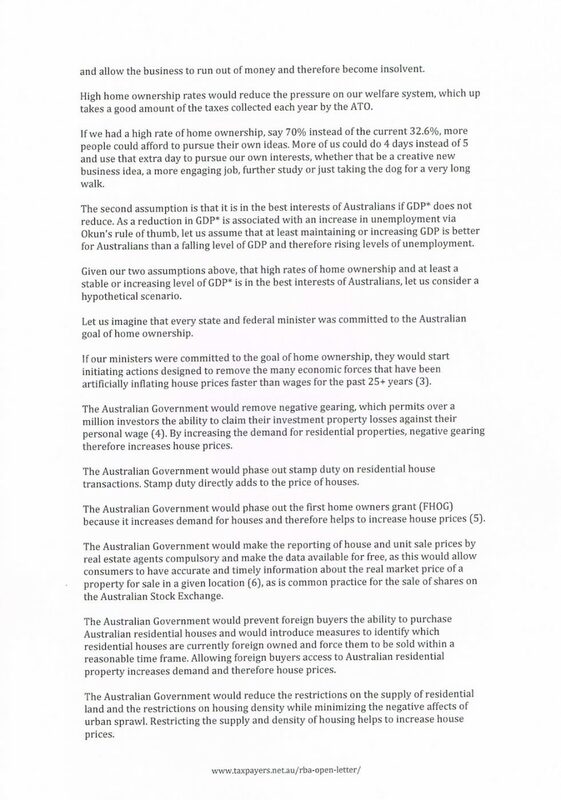 The Australian Government would make the reporting of house and unit sale prices by real estate agents compulsory and make the data available for free, as this would allow consumers to have accurate and timely information about the real market price of a property for sale in a given location (6), as is common practice for the sale of shares on the Australian Stock Exchange. The Australian Government would prevent foreign buyers the ability to purchase Australian residential houses and would introduce measures to identify which residential houses are currently foreign owned and force them to be sold within a reasonable time frame. Allowing foreign buyers access to Australian residential property increases demand and therefore house prices. The Australian Government would reduce the restrictions on the supply of residential land and the restrictions on housing density while minimizing the negative affects of urban sprawl. Restricting the supply and density of housing helps to increase house prices. If the Australian public were to commit to the goal of home ownership, then, like our ministers, they would change their behavior to achieve the goal. While most Australians with a mortgage try their best to pay back both the principal and interest on their loan, for every year since 1990 they have actually borrowed more from the banks than they have paid back. Between the year 1990 and 2000, despite trying to pay back their existing mortgages, Australians ended up borrowing an average of $13.5 Billion extra every year from the banks, bringing their net debt to the banks due to their residential mortgages up from $64.9 Billion in 1990 to $199.7 Billion by January 2000 (7). Between the years 2000 and 2010, the Australian public increased their efforts to bid up the price of their own homes by borrowing an average of $53.54 Billion extra per year from the banks. By January 2010, their debt to the banks due to their mortgages had increased to $735.1 Billion. If the Australian public were to commit to their goal of home ownership, common sense would dictate that as a group they would start paying back their $840+ Billion mortgage to the banks. Instead of borrowing an extra $50+ Billion per year from the banks to bid up the price of their houses, they would start paying back more every year than they were borrowing. 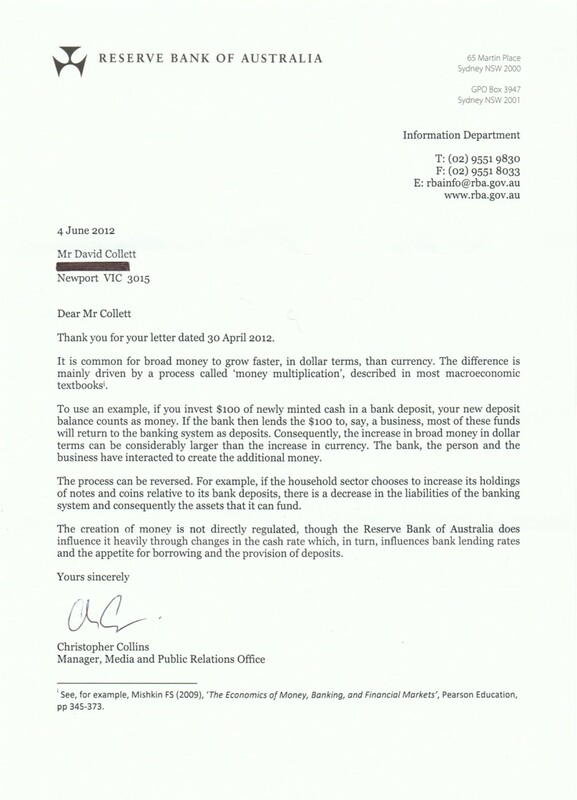 If the Australian public and their representatives both committed to the goal of home ownership, the money creation process would go into reverse, as you pointed out in your letter. Instead of the banks creating billions of dollars per year out of thin air, that enters the money supply in the economy via mortgages, billions of dollars would be disappearing each year, leading to a decrease in GDP and therefore rising unemployment. I believe the above points suggest that our current fractional reserve banking system is not aligned with a people and a government who intend to pursue home ownership. Why is any of the above relevant to the RBA? Since over 95% of all money circulating through our economy is debt created by the banks, which at one point in time would have been a transaction falling within the Payment System above, the RBA has a responsibility relating to the use of fractional reserve banking, because the new money cannot enter the Australian economy unless it passes through the payments system. Point a. above does not state that the Bank’s payments system policy should be directed to the greatest advantage of NAB, ANZ, Commonwealth Bank and Westpac at the expense of the Australian people and our government. I believe that given all of the above, the RBA has a legal obligation to become aware of and consider alternatives such as full reserve banking. 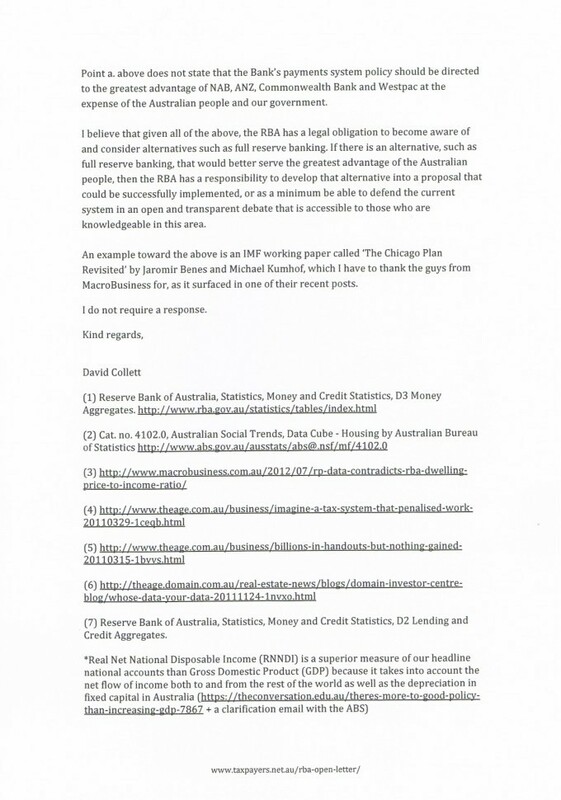 If there is an alternative, such as full reserve banking, that would better serve the greatest advantage of the Australian people, then the RBA has a responsibility to develop that alternative into a proposal that could be successfully implemented, or as a minimum be able to defend the current system in an open and transparent debate that is accessible to those who are knowledgeable in this area. An example toward the above is an IMF working paper called ‘The Chicago Plan Revisited’ by Jaromir Benes and Michael Kumhof, which I have to thank the guys from Macrobusiness for, as it surfaced in one of their recent posts. I do not require a response. Does the RBA have an equivalent paper explaining how Australian dollars are created in Australia / how our money supply increases each month ? If not, would the RBA be prepared to write such a paper? 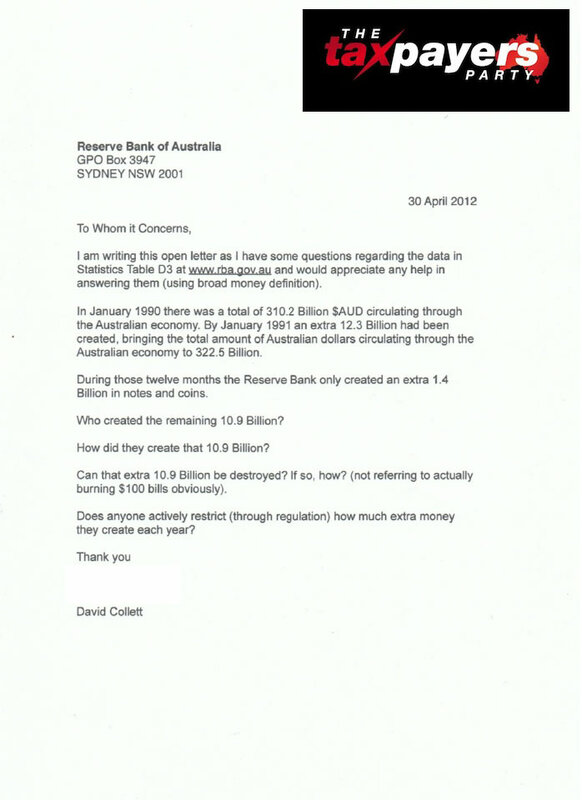 If nobody can write one, does the RBA agree with the explanation given by the Bank of England? I refer to your letter to the Secretary of the Bank dated 4 June 2014. 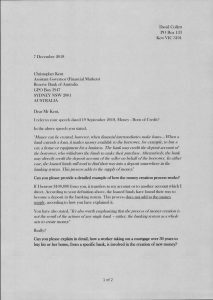 The RBA has not produced an equivalent paper to the Bank of England document that you refer to in your letter, nor does the Bank have plans to produce a similar paper at this stage. That said, the explanation of money creation in the modern economy has broad applicability to Australia. As explained in the article, when a loan is made a deposit is created, although the exact way this is done may not be immediate. For example, some loans are in the form of a bank cheque which will be deposited at a commercial bank. There are, however, constraints on the amount of loans that can be made, some of which are mentioned in the Bank of England article. A key point is that in equilibrium, there must be depositors who are happy to hold those deposits, which is something James Tobin, the Nobel Laureate, wrote about. Ultimately, the central bank acts as the nominal anchor, and exactly how that occurs depends on the operating procedures of the central bank. Is the Reserve Bank of Australia owned by the Government? The Commonwealth of Australia owns the RBA. The RBA is a body corporate who’s role is set out in the Reserve Bank Act 1959. How does fractional reserve banking work? Australia doesn’t have a fractional reserve banking system. In practice, there is no set money multiplier to which banks have to adhere to. Other than currency, new money is created by issuing loans. Christopher Kent, Assistant Governor (Financial Markets), RBA, 19 September 2018. Speech: Money – Born of Credit? I refer to your speech dated 19 September 2018, Money – Born of Credit? Can you please provide a detailed example of how the money creation process works? If I borrow $100,000 from you, it transfers to my account or to another account which I direct. According to your definition above, the loaned funds have found their way to become a deposit in the banking system. This process does not add to the money supply, according to how you have explained it. Can you please explain in detail, how a worker taking out a mortgage over 30 years to buy his or her home, from a specific bank, is involved in the creation of new money? Referring to Graph 3: Isn’t the replacement of offshore deposits and offshore debt with Debt** somewhat misleading? Also, notice you’ve stated money is created via issuing new loans, yet Graph 3 makes no reference to how much Banks have self-funded via new money creation between 2004 and 2018. Issuing a bond or offering new shares on the stock exchange does not create new money. Customer deposits moving around the banking system, by themselves, do not create new money. Can you please refer to which current legislation allows financial intermediaries to create new money by issuing loans? Which loan types can be used by ADI’s to create new money? The Taxpayers Party © 2009-2019. All rights reserved.